← DEBT…One Word, Express In One Hundred Words In One Hundred Days. WORD…One Word, Express In One Hundred Words In One Hundred Days. God Founded The Heavens And Earth By His Words. The Word And God Are One. The Word Has The Capacity And Capability Of God. Nothing Was With God In The Beginning Except The Word. 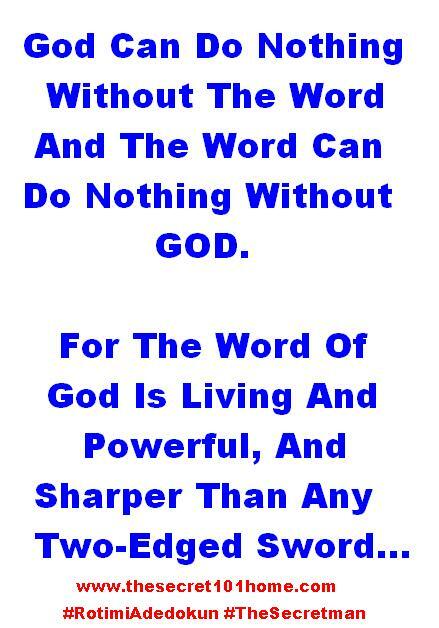 God Can Do Nothing Without The Word And The Word Can Do Nothing Without God. The Word Can Shatter Darkness And Keep Confusion At Distant. This entry was posted in Life and Time Management, Love, Self Development, Spirituality, The Secret, Vitamin Of The Mind and tagged Bishop David Oyedepo, In The Beginning Was THe Word, Jim Rohn, John 1:1, Pastor E A Adeboye, Rotimi Adedokun, The Word Of God. Bookmark the permalink.